Имате въпрос към Jiwa Guest House? Удобно разположен в Бали, Jiwa Guest House е чудесна стартова точка, от която можете да започнете да проучвате този оживен град. Разположен на 1 km от най-вълнуващите части на града, този 1-звезден хотел притежава отлично местоположение и осигурява лесен достъп до най-големите забележителности. С удобното си местоположение хотелът предлага лесен достъп до всички градски забележителности, които задължително трябва да се видят. Jiwa Guest House предлага безупречно обслужване и необходимите удобства, за да удовлетвори гостите си. 24-часов рум-сервиз, безплатен WiFi достъп във всички стаи, 24-часова охрана, 24-часова рецепция, експресно настаняване/напускане са само част от нещата, които отличават Jiwa Guest House от останалите хотели в града. Като допълнение всяка хотелска стая предлага широка гама от удобства. Много от стаите са с огледало, хавлии, достъп до интернет (безжичен), безжичен интернет достъп (безплатен), климатик, за да удовлетворят и най-изискания вкус. Хотелът разполага с голямо разнообразие от развлекателни съоръжения като открит басейн, градина. Когато търсите удобно и комфортно място за настаняване в Бали, изберете Jiwa Guest House, който ще се превърне във втория Ви дом. Дружелюбный хозяин. В номере убирали раз 3 дня. Бронировал номер у басейна, дали другой. Завтраки приносят на балкон у номера, пару раз забыли, исправились после напоминания. Цена конечно номера возле бассейна для Убуд показалась высокая, но нам всё очень понравилось, хоть номер и не новый. Everything was fantastic. Balinese or Western breakfast is one of the best if not the best tasting and filling of all places we have visited in Asia. The rooms are beautiful and clean. We stayed 2 nights in a Delux Double Room then extended our stay for 2 nights in a standard room. Only difference was the size. Both room and bathroom were a bit smaller but both rooms were great. Pool was lovely and staff were friendly. Main Street of Ubud was only 100mtrs down the street. We also loved Ubud and will definitely be returning. 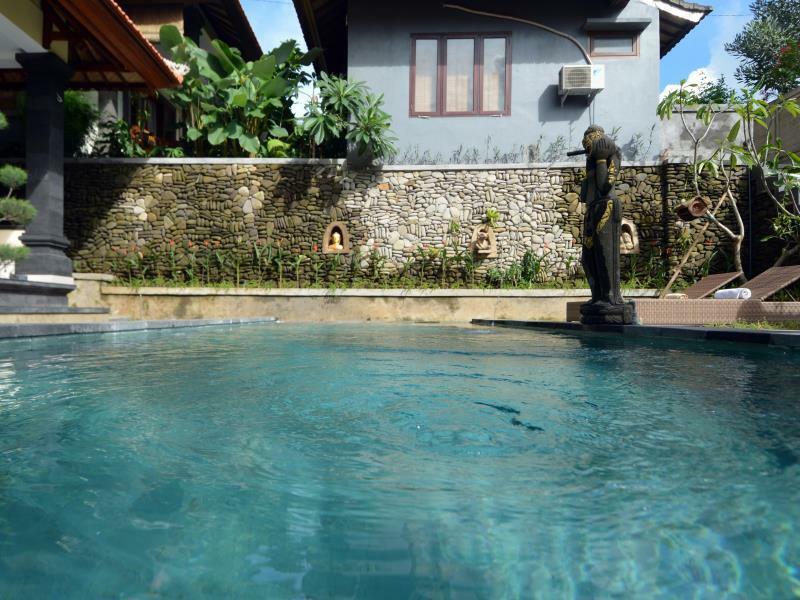 I recommend Jiwa Guesthouse because of the extraordinary hospitality and kindness that the Jiwa family gives. This place is an oasis of tranquility. Yes, there are roosters crowing as some other reviews have mentioned, but it was soothing to me. The room was clean and comfortable with an old world style lost in modern places. The location is perfect, on a side street not far from a main road with plenty of restaurants (warungs) nearby, including a great place right across the road. The Jiwa family made me feel like I was part of their home and welcomed me to participate in Hindu ceremonies, which was an invaluable spiritual experience. Finally, it’s an incredible value for what you pay. The rooms were very big and they cleaned them every day. They offered a broad selection of breakfast choices and it was very delicious. the pool area was nice and good to cool down and relax after a long day of sightseeing. 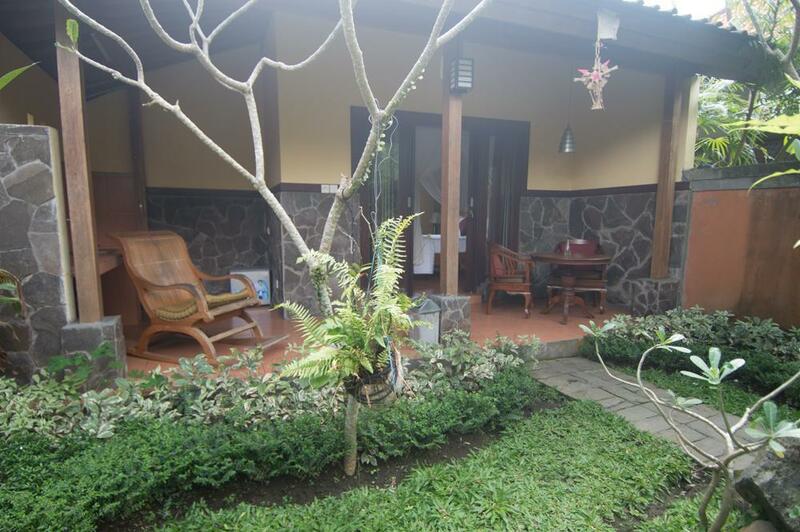 If I come back to Ubud, I will choose Jiwa Homestay again. Nice quiet location (except rude noisy neighbours one night), lovely people to stay with. Late check in, Gaday came and picked up from airport for good price. Location is off the main roads and an easy walk to all the good shopping areas. Will definitely stay here again!!! The location was awesome in the centre of ubud. They had a cute pet bird that says hello. The rooms were very clean and modern and breakfast on your balcony was a treat. The pool was nice and the staff are very helpful. Would definitely stay there again. Best room we have stayed in on our whole Asia trip. Rooms are huge. Breakfast included with huge selection and brought to your room to have on your balcony. Staff very friendly. Right in the centre of Ubud. Walking distance to lots of restaurants and shops. Hired scooter from hotel to get to rice fields and waterfall 50k per day. Only con was there as so many roosters crowing all day and night. It was very annoying but we had earplugs which helped at night. 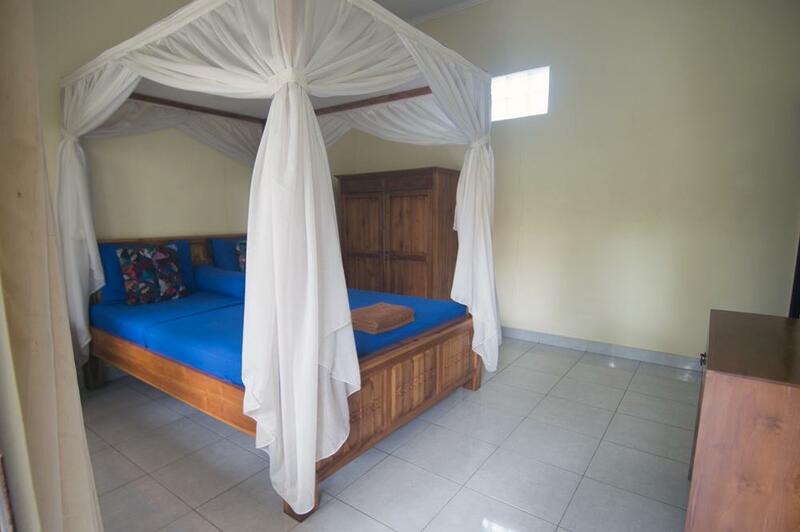 Conveniently located yet quiet, relaxing and casual, great little pool and garden, clean and spacious rooms, and nice breakfast delivered to your room every morning. Stayed in one of the "pool view" rooms, which are located furthest from the road & the menagerie of birds and therefore apparently the quietest. 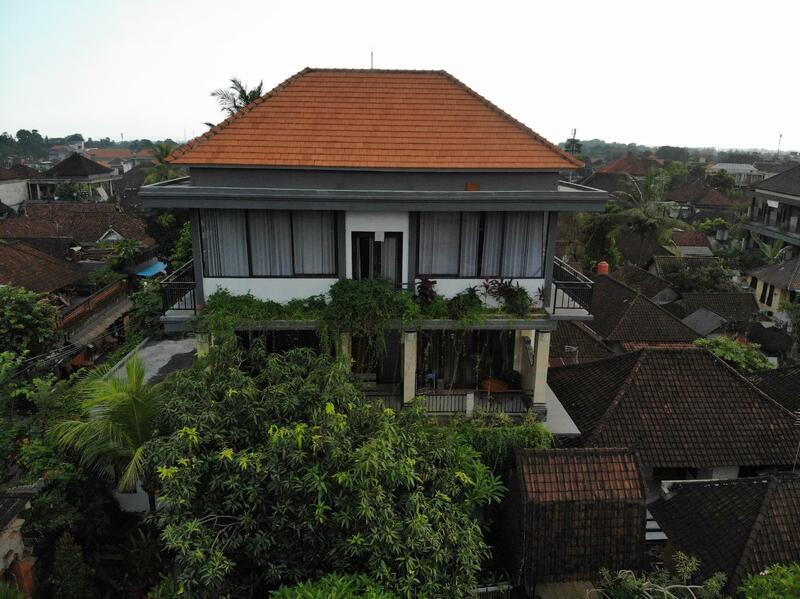 Lovely guest house in the heart of Ubud, owned by adorable family! Perfect location (only 1 minute from Ubud center), immaculate clean room with lovely Balinese decor, gorgeous balcony with beautiful view... The breakfast was fantastic, the lush tropical garden was so peaceful and serene, the people were extremely kind and helpful. We would highly recommend this peaceful hidden gem to families with kids. Can't wait to come back here again! I arranged an airport pickup through the guesthouse. Jiwa's son came to collect me. He had tons of advice about other areas to visit. They arranged a tour for me and suggested where to exchange money and which simcard to get. It was the perfect place to get set up in Bali. 100 m from the main road but very quiet and relaxing. There is a lovely pool for swimming, wifi, Bruno the dog and koi fish. Ice cold aircon in the room as well as a fan. Good cupboard space to unpack. I stayed for 5 nights, but could easily have stayed for a month! Breakfast has a great variety and is substantial. I loved my stay at Jiwa's house. Near enough to walk to Monkey Valley road and Hanuman. There is a lovely cosy restaurant just across the road. And a 24 h shop just at the bottom of the road on the main road. I loved the Balinese house feel of this guest house. It is actually the ancestral home of the family that manages it. Nice temple and great pool. I would certainly stay again. Mr jiwa' s family is very kind. I like to stay at their place. For breakfast, they will deliver it to your room. Amazing! Just 5 minutes walk to shops and restaurants. Recommended!! Not very far from the eateries and bars, very nice garden and swimming pool, great room- real value for money. The staff are great as well. Breakfast is served at your porch. I will definitely book Jiwa's again the next time I am back in Ubud. This part of the house were I stayed was new buidling. Good shower and comfortable bed. Very clean and quiet place. Close to the Ubud market. A lot of choices for breakfast and it is available until 11.30.
staff verh friendly and helpful. room spacious with comfy bed. great breakfast delivered to room each morning. grounds well kept with lovely clean swimming pool. fabulous location. would stay here again.